In the haze of the Blink-182 reunion Angels and Airwaves, known alternatively as a supergroup or as Tom DeLonge’s ‘other band’ may have slipped the minds of many people. And as for the release of the second studio album in Angels and Airwaves’ ‘LOVE project’, it’s a shame that the return of nostalgia overshadowed the anticipation of this in many ways. This album, still holding onto that distinctive ambient-rock sound that got Tom DeLonge so excited about the band in the first place, holds a special place in the history of the band as the last to feature one-time Offspring drummer Atom Willard, who was recently replaced by ex-Lostprophets and Nine Inch Nails drummer Ilan Rubin. The record kicks off with the synth-led rock romp that Tom DeLonge’s voice so oddly suits, and looking back, the instrumentation had really fallen into place along the evolution of the band, from the overly-dramatic effort of ‘We Don’t Need To Whisper’ to today the sounds of Angels and Airwaves have become much more compact and natural, sounding much more like a good musical effort than an attempt at transforming the band into the John Williams of rock. In fact the first song to really break the formula is first single ‘Anxiety’ which reignites the album’s musical flames, and the excitement of the listener. It’s harder than its predecessors, which though impressive, were almost typical of what we would expect from the band. ‘Anxiety’ is much more, it’s almost Darwinian. The trend of ambient elements mixed with both standard rock and experimental elements continues throughout the record, coming out with some pretty solid songs, such as the phaser-ridden ‘The Revelator’ and the almost techno ‘Dry Your Eyes’, with the latter truly excelling in both style and execution. None however, are as different, or as big a break from the formula as the bouncy ‘One Last Thing’ a song with pop elements, a U2 style guitar riff and a simple but effective vocal line to boot. Not to mention the sampled speech which along with the music falls somewhere in between haunting and heart-warming. 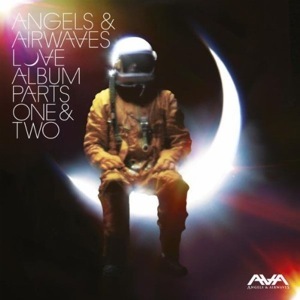 Overall, it’s a welcome addition to the Angels and Airwaves discography, an effort that should be recognized for what it is; a solid, catchy and innovative rock record. 'LOVE II' is out now.